Is it possible for Voyager 1 or 2 to reach any other star? If yes, which one is it and how much time does it take to do that? And in which direction are they now, and could we still communicate with them in 50 years? The Voyagers cover about 3 astronomical units (500 million km) per year (141 AU in 50 years, with some rounding off). One light year is 63,000 AU, so they cover one light-year in 21,000 years. The nearest stars are 4 light years away, so would be reachable in 80,000 years. The Voyagers aren't aimed anywhere in particular, and at those time scales the stars move as well so it'd difficult to say which star they will intercept. We can't significantly change their course any more, so we can't aim them at Alpha Centauri. Here's an (old) map that shows the positions of Voyager 1, 2 and Pioneer 10,11. They're about twice as far away now, but at least you have an indication of their directions. 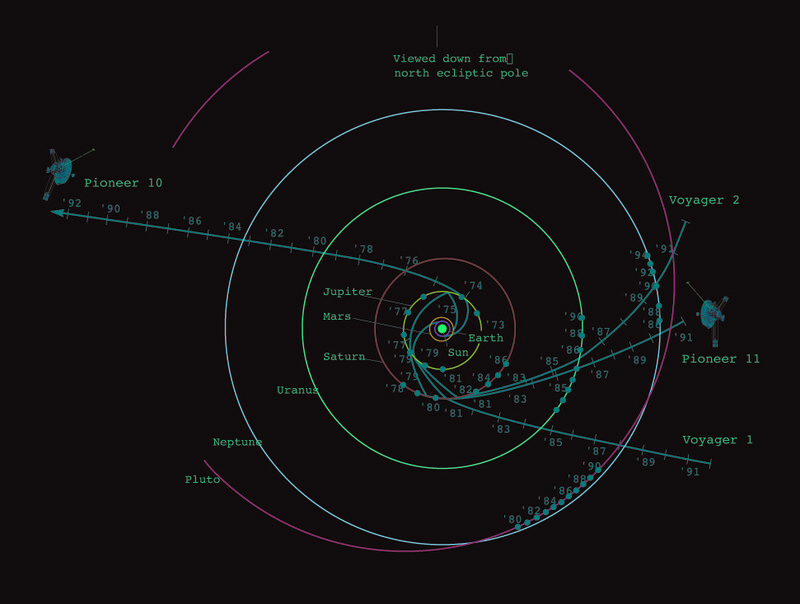 NASA's Eyes on the Solar System gives a realtime position. Voyager 1 and 2's missions are expected to last until about 2025, then their power sources will decay to a point where they can't power the transmitters. It doesn't look like they are going in the right direction at the moment, though it would take a little more work to see how the stars are moving and their gravitational perturbation on the the spacecrafts will behave. All coordinates in degrees, from this question and Wikipedia. Not the answer you're looking for? Browse other questions tagged probe interstellar-travel voyager or ask your own question.